Five hours before her flight home, on her 24th birthday, Kanchan Singh walked into a Thai cat café and felt like she’d been hit by a brick wall. The answer once seemed so clear, before cultural expectations and parental pressure took hold of Kanchan’s ambitions. Born and raised in India, Kanchan’s childhood revolved around animals. Her first pet was a peacock, and by kindergarten she was a vegetarian. After immigrating to the U.S. when she was 14, Kanchan spent her teens volunteering at local shelters, where she was distressed to see such high euthanasia rates—most often due to a lack of space. She founded the Terps for Animal Welfare club her freshman year at the University of Maryland, and vowed to work on systemic changes after graduation. Instead, her passion was pushed aside. Waking up in Thailand, she felt full again. Looking around the cat café, Kanchan noticed nothing but Americans and Europeans. She’d never heard of the concept before, and could already see a business taking shape back home—incorporating an adoption model that didn’t exist in Thailand. Kanchan recognized a cat café could also reduce the high return rate for shelter cats who are stressed out and shut down inside a cage—their personalities a guessing game. Sitting with a pile of cats and a brain full of inspiration, Kanchan announced she was quitting her job. Flying back with nothing more than a backpack, she mapped out the entire business plan for Crumbs & Whiskers on a stack of United napkins. The plane ride felt minutes long, but her excitement was quickly tempered by a lackluster response when she landed. Still, she saw the need, and forged ahead. Kanchan was far from dumb. When the cat café debuted in Georgetown in 2015, there was a line down the block more than two hours before the doors opened. They did $22,000 in sales in one day, and were booked for an entire month. Kanchan was praying business would actually slow down during those first few months. She realized the café could only comfortably accommodate 18 people at once—not 30, as the architect had suggested—and adopted the model accordingly. Today, business is steady for the 70-minute experience, where guests can interact with 25 cats—all in need of a permanent home. Food and drinks are ordered onsite, and delivered by Olivia Macaron. Crumbs & Whiskers partners with rescues that pull cats scheduled to be euthanized at high-risk shelters. If the cats are comfortable in a communal rescue room, they come to the café. 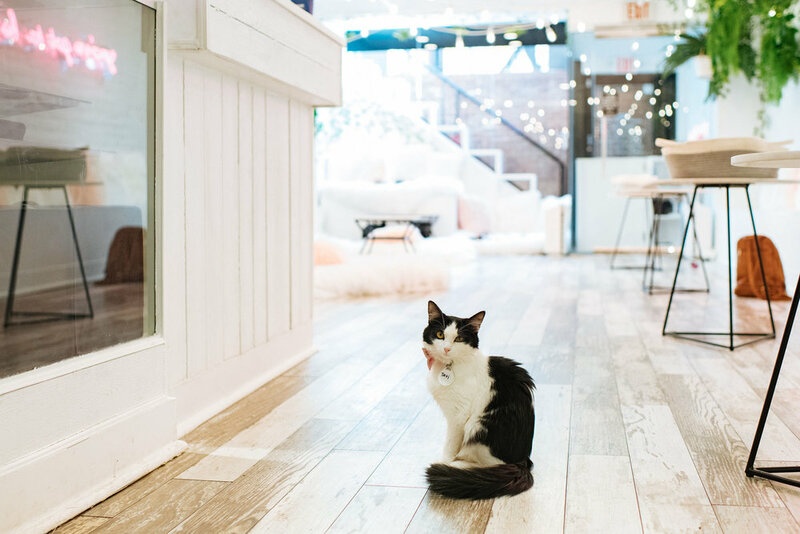 Although Crumbs & Whiskers doesn’t allow same-day adoption—their antidote to ‘impulse buying’—nearly 1,000 cats have been successfully adopted between Georgetown and Los Angeles, where Kanchan opened a second location in 2017. The goal is to create an upgrade for each cat until they find their forever home. After a day full of cuddles, kisses, and Instagram stories with people, the cats have free range of the café at night. 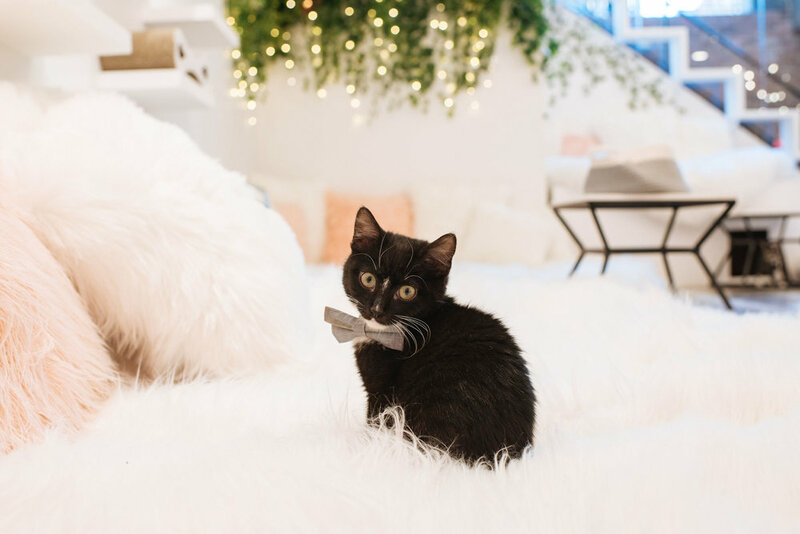 With Crumbs & Whiskers established on both coasts—the likes of Bella Thorne, Keith Urban, and Nicole Kidman among its California patrons—Kanchan tested a new kitten party concept that proved wildly successful. When she learned their partner rescue was desperately trying to save kittens at risk to be euthanized during kitten season—early spring through late fall, when the greatest number are born—Kanchan knew she could do something. Serendipitously, she found an M Street space whose lease overlapped by five months with Crumbs & Whiskers’ O Street location. 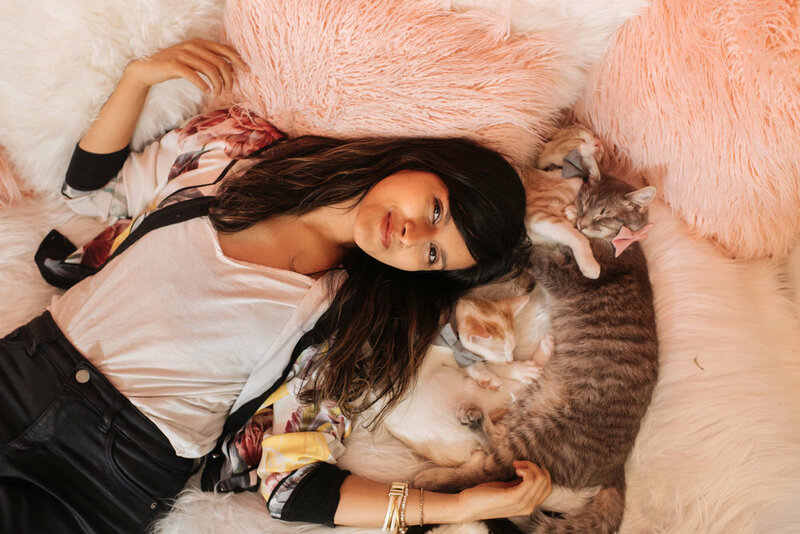 Kanchan seized the opportunity and opened The Kitten Lounge in early March—a four-month pop-up before Crumbs & Whiskers permanently relocates to M Street. Kanchan says the 15- and 30-minute Kitten Lounge bookings provide quick therapy, with ‘giant floofy things’ resembling clouds for guests to sit on while playing with the kittens. Crumbs & Whiskers receives weekly requests to expand worldwide—from Moscow to Mumbai—while animal cafes in Japan have moved on to owls and snakes. Kanchan won’t entertain the latter—uninterested in models that don’t have an end-goal of adoption.